420 Lexington Avenue, also known as the Graybar Building, is a famous Midtown Manhattan office building. Just blocks away from Grand Central, the skyscraper stands 30 stories tall. The building was completed in 1927, after being designed by Sloan & Robertson. Towering magnificently above Grand Central Terminal, 420 Lexington is also known as the Graybar Building. 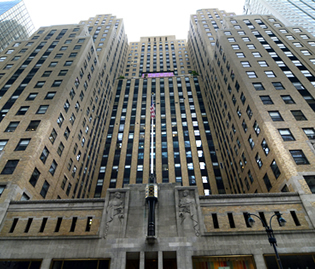 Named after one of its original tenants Graybar Electric, the building is New York's most convenient location. 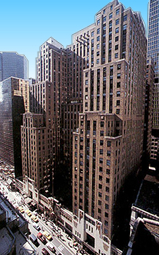 Blocks away from Grand Central Terminal, this building has access to all the transportation most any company needs. A classic class A building that offer refinement and sophistication for your business. A beautiful area that has fine retail and office buildings in the general vicinity. Centrally located and near the New York Public Library, Bryant Park, Times Square and many others. This Office Commercial Building has a square footage of 1,323,061 ft². It scored an energy efficiency rating of 82 in 2013, which is the average for all New York Energy Star Buildings & Plants. For more information on 420 Lexington Avenue, contact a New York Office Space broker today. Beautifully restored building with a majestic art-deco lobby projects the right image to your clients. Full-time, on-site management and staff. Building tenants are Fortune 500 companies including major financial, real estate, international law firms and technology companies. The Graybar Building is not an official landmark, but it certainly is distinctive, with colorful bas-relief figures somewhere between Assyrian and Art Deco. The building was designed by Sloan & Robertson. Their most fanciful touch was to install cast-metal rats on the cables holding the canopy over the Graybar Passage. At the top of each cable is a conical baffle, similar to those that prevent rats from crawling aboard ships along mooring lines. What is Energy Star Efficient Building? EPA, in conjunction with stakeholders, developed the energy rating as a screening tool; it does not by itself explain why a building performs a certain way, or how to change the building’s performance. It does, however, help organizations assess performance and identify those buildings that offer the best opportunities for improvement and recognition.